Wales is a country that is part of the United Kingdom. It is situated to the west of England and for a small country, has a varied and dramatic landscape. It covers just over 20,720 km² – that’s about half the size of Kerala. Wales is both beautiful and accessible being only a couple of hours drive from London or cities such as Birmingham and Manchester. The population is three million, with 300,000 people in Cardiff, our capital city. Four universities (of the ten in Wales) and a vibrant population fuel a cosmopolitan city atmosphere. Cardiff Castle stands at the heart of downtown and Edwardian shopping arcades (Britain’s first malls) house charming one-of-a-kind shops. Wales is home to 641 castles, more than any other country in Europe. You are encouraged to visit them: climb towers, walk ancient walls and explore dungeons. It’s rare to find three national parks in a country the size of Massachusetts. But in the Snowdonia, Pembrokeshire Coast and Brecon Beacons national parks you’ll discover unique landscapes and a world of outdoor adventure. Wales is home to HRH Prince William of Wales. Royal connections abound and everyone can be spoiled by staying in hotels formerly owned by kings and queens. 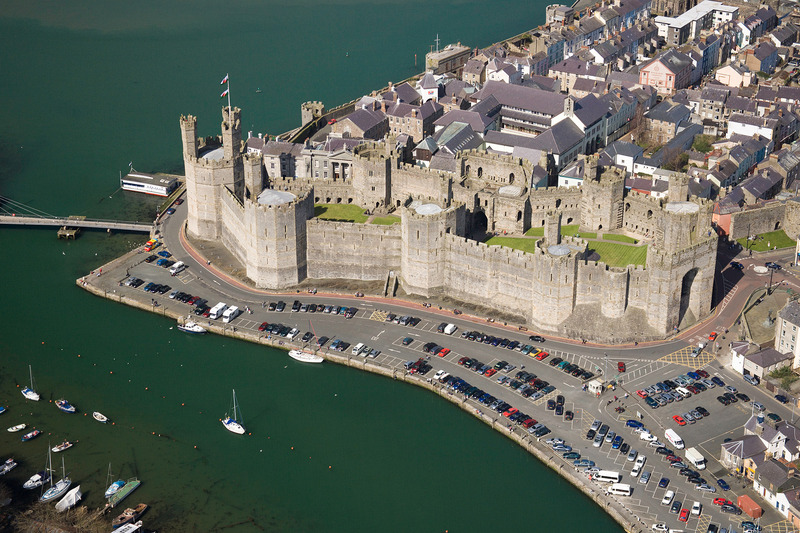 Aerial view of the Caernarfon Castle in Gwynedd, north-east Wales. It is one of the most important historic sites of Wales. Visitors to the Wales Coast Path are in for a feast of festivals, as well as scenery, this season as they make their way along the country’s spectacular coastline. Visitors can take a break to sample everything from, among others, a multicultural celebration to a festival devoted entirely to mackerel and a seriously fishy festival in Milford Haven. If ever proof was needed of just how much is packed into Wales as a small country, the sheer variety of events to be enjoyed around the coast in the coming months offers huge choice no matter what your interests. Food, drink, music and family activities are everywhere. Wales’ traditional Eisteddfodau are complemented by food and music from different cultures around the world. The water itself plays a key role in things to do over the summer too, with, among other things on offer, a wakeboard competition, coracles racing in the River Teifi and extreme sailing competitions. And a range of intriguing and more relaxing ways of passing the time are there to be experienced around the coast too, including dipping into the world of ceramics or getting the bug for Beetles – of the VW kind. It’s all accessible from the Wales Coast Path. Stretching from the Welsh border in North Wales to Chepstow in the south, it’s the world’s longest continuous coast path around a country. Lonely Planet, the world travel guide, thinks it’s extraordinary, choosing the path as the world’s greatest region in its 2012 best-in-travel guide, ahead of attractions like the Ruta Maya in Central America, and Canada’s Maritime Provinces. A great mix of festival fun and all within walking distance of the Wales Coast Path. Cardiff Harbour Festival, 24 to 26 August. The established festive returns with Extreme Sailing! International sailing professionals competing up close as they whizz past close to the crowds, plus a host of free activities, Tall Ships, a continental market and top fishmongers competing in a series of precision skills tests. I could not resist commentinց. Exceptionally well written!